Coming June 21st from Shout! Factory is a pairing of two Western classics - Rio Conchos and Take a Hard Ride. Two very different films but still a treat for western fans, especially in this low price set. 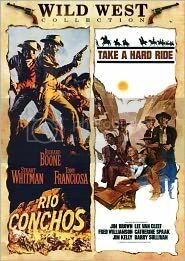 I had heard of Take a Hard Ride before because of its great cast but had never heard of Rio Conchos. I've been watching a lot of westerns lately so I couldn't pass it up. Rio Conchos stars Richard Boone as an ex-confederate army officer named Lassiter. He is found with a stolen army rifle and is thrown in jail. A Mexican bandit who is also an old aquaintance (Tony Franciosa) also shares his cell and Lassiter makes a deal to show the army where the rest of the stolen guns are if they let him and his cell mate accompany them. The pair, along with army Captain Haven (Stuart Whitman) and Sgt Franklyn (Jim Brown) travel through the west to find Colonel Pardee (Edmond O'Brien), who Lassiter claims to have the guns, all the while fighting off attacks from Apaches. Take a Hard Ride also stars Jim Brown, this time as Pike, who is attempting to transport $86,000 to the widow of his recently departed boss. Along the way he meets up with Tyree (Fred Williamson), a smooth gambler, a prostitue (Katherine Spaak) and her half breed, mute friend Kashtok (Jim Kelly) who also happens to be a kung fu master. Together they fight off a mysterious bounty hunter (Lee Van Cleef) and a whole slew of other baddies. Shout! Factory delivers the goods once again on this great entry in their Wild West collection. The true winner of the two films here is definitely Rio Conchos. One of the most oddly heart wrenching westerns I have seen, especially the scenes with the baby, Rio Conchos also delivers in action, vibrant characters and a great story. I have heard that the film is very similar to the John Wayne film The Comancheros (both films share a screenwriter) but I haven't seen it so I can't comment as to if it is a ripoff or what. Regardless, it is a great film and a true gem of the genre. Take a Hard Ride, though not a classic, is still pretty damn watchable. Jim Brown, Jim Kelly and Fred Williamson team up again as a trio of badasses trying to right the wrong. Williamson's jive talk and some pointless scenes (the fist fight at the end of the film) hamper the film but it is still worth a watch just to see this great cast in action. The climax is exciting and the humor lightens the tone of the film. Overall, this set is a must for western fans, blaxploitation fans and action fans. Also included are insighful new interviews with Fred Williamson and Jim Kelly, as well as trailers.